We can all agree that in Ventura, there are only a handful of days a year where you might think twice about biking because of the weather. But there could be a variety of other reasons you choose not to ride a bike: maybe your bike is uncomfortable, or not suited to ride more than a few blocks. Maybe you wouldn’t know what to do if you got a flat tire, or other mechanical issues with the brakes or shifting. OR maybe you just don’t feel confident sharing the road with motor vehicles. 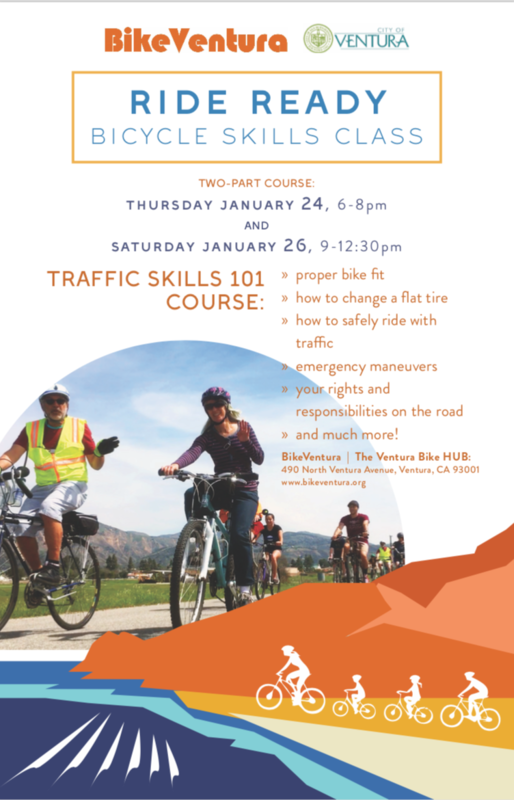 BikeVentura’s Traffic Skills 101 course will teach you the skills and give you the confidence so that you won’t think twice when you want to bike to work, school, on errands, or for pure fun. We’ll show you how to know what bike is right for you and your riding style, some basic maintenance, and how to fix a flat. In Part II, you’ll learn about your rights and responsibilities on the road, so you can ride safely and confidently, and then we hit the pavement and go over emergency maneuvers and then take a spin around town putting what we’ve learned into practice.